Club Penguin Cheats by Mimo777 Club Penguin Cheats by Mimo777: Club Penguin Newspaper Bug Update! Be sure to check back here for all the new cheats once this catalog and pin are released! Also, Coins for Change will be here THIS month! Yikes! Better start saving your coins so you can help others around the world! Hey mimo, when i click on the penguin art in the book room, it wont let me access it, is that just me or can no-one access it?. This stinks. I was waiting for the catalog all week and now I gotta wait an extra day? Come CP! Hey mimo, even though you said no urls, i want to send a urls to you privately, how do i do that??? yeah i noticed that plus mimo when r u gonna have another cp party? Wow the new clothes look AWESOME! But there dosen't seem to be much boy clothing. What do you think, Mimo? mimo777 ive got something new theres a new start screen and it said that new members get 12,000 coins to start with. Hi Mimo77 there is a new pin at the snow forts by the secret code on the clock. mimo cp has updated the catolog and a new pin and alse a moving background! yes MOVING! in the new catalog it let me buy the santa hat even though i already have it. I've heard about this glitch. It's also happening to other people. Club Penguin should fix it soon. Yes, it let me buy all of the Santa outfit and I already have it too. Maybe it's because these are from the catalog and not free items. 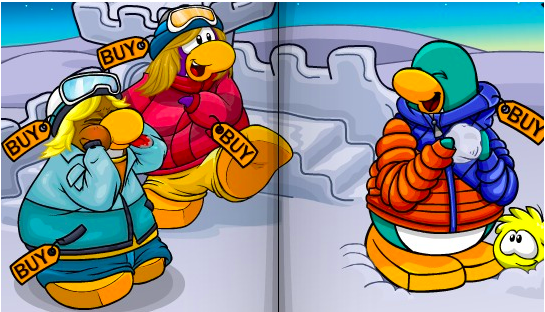 I still have the old newspaper, is it just me or is it some other penguins too?